I regularly use the tail command to look at the end of log files - generally I use the -f flag to follow (monitor and display) new entries that are appended to the log. Tail will poll every second to see if the file size is changed and will act if data has been appended or the file has been truncated, and the poll interval is adjustable. However, polling a file is plain ugly, it causes extra wakeup events and if one wants very fast updates then polling is not a good solution. Hence, a better tool to use is inotail when following a file. Inotail uses inotify to only wake up inotail when a file has been modified, deleted or moved - hence no polling is required. This also means inotail will output the changes to a file almost immediately - unlike tail which by default may wait almost a second before detecting a change. ..and use it the same was as tail. The fiemap ioctl() allows user space programmes to glean the extent information from a file's inode in a fairly direct and fast way. Mark Fasheh (Suse) has written up a detailed description of this ioctl() in a LWN article, and this is really worth reading. I've put some quick-and-hacky sample code in my repository to dump out the file extents of given files. This code works in two phases. Step 1, one allocates a fiemap structure and queries the number of extents a file has. Step 2, one re-allocates the fiemap structure with enough space for the extent data to be filled in by the ioctl() and re-issues the ioctl() query to get the requested extent data. Data such as the physical and logical block location and also the size of the extent and extent flags is returned for each extent. Code such as ureadahead uses fiemap; ureadahead in fact re-probes with the fiemap ioctl() if it detects that the number of extents has increased - just in case the file is growing during the probe. It appears that cp has recently been modified to use FIEMAP to detect where holes are in a file to make copying more efficient. However, some users have reported seeing cp corruption issues - the root cause was that FIEMAP was not dealing with regions of a file that have been written to that don't have blocks yet assigned. This is alarming, as the delayed allocation mechanism is used by modern filesystems. This is described in more detail in a recent LWN article. "Updates have now been installed - you may reboot"
"Updates have now been installed, unfortunately Microsoft users are forced to reboot to get the goodness." "Updates have now been installed, you may restart, unless you are using Linux, in which case you don't have too." Excellent! I'm really glad the BBC is listening! Kudos to Zoe for being so enlightened! I'm now back from having several weeks rest after a major operation on my neck to replace a slipped disc with a Titanium one. The operation went well, I just need to now focus on doing a lot of regular neck exercises through the day to keep me from seizing up. Thankfully I found a neat little application called WorkRave. WorkRave is designed to help stop repetitive strain injury (RSI), but I've been using it to tell me when to have short breaks to exercise my neck and back. WorkRave keeps track of mouse movements and keystrokes, it can be very revealing just how many meters one moves a mouse in a day and how much one can type! It also keeps the stats on a daily basis, so one can see one's desktop usage over a period of weeks and months. 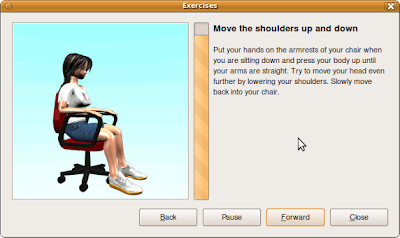 I'd recommend using this application if you need regular desk-exercise and don't mind a little bit of regular nagging from the computer. Give it a try! It's certainly helped me!